When your baby begins cutting teeth, you may notice symptoms ranging from a cough and diarrhea to excessive drool and a rash around her mouth. Most symptoms of teething, including a facial rash, are only temporary and will go away when the teeth break through the gums, but if you are worried about your child, contact your pediatrician. According to pediatrician William Sears, it is common for babies to get a facial rash when teething. Generally, you will notice a red, raised rash that appears around his mouth and on his chin, lips, neck or chest. 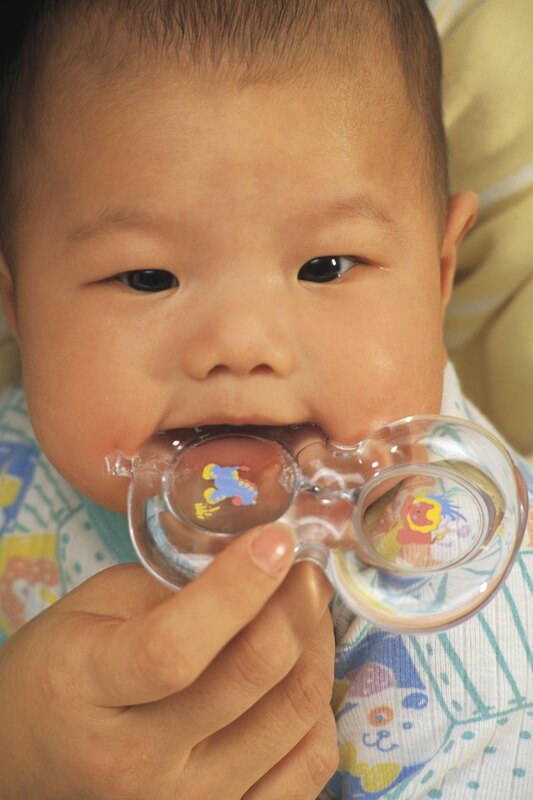 The rash is caused by excess saliva stimulated by the teething process. The saliva dries and chaps the skin, which causes irritation. To prevent a rash from occurring, try to wipe saliva off your child’s face throughout the day while he plays. If the rash has already developed, however, begin by using warm water to gently wash and wipe away the saliva. Pat the area dry with a soft cloth. Be careful not to scrub or push hard when cleansing the area to avoid irritating your baby’s skin even more. Dr. Sears recommends using a lanolin ointment on the irritated area to prevent the rash from getting worse. Lanolin is a cream ointment made from the wax in sheep's wool and is often used to moisturize and heal dried skin. The cream acts as a lubricant for dry, irritated skin and can form a barrier between your baby’s drool and her chin. Put the ointment on after washing and drying her face and before she goes to sleep for the night. Petroleum jelly is a different option that can moisturize and heal dry skin, according to the Baby Center website. Put the jelly on at bedtime and naptime, after washing and drying your baby’s face, to prevent the rash from getting worse. Generally, petroleum jelly is considered safe, but there is a very slight risk that inhaling petroleum jelly for a prolonged period may cause lung problems, such as inflammation, according to MayoClinic.com. Talk to your pediatrician about using petroleum jelly for your child’s facial rash.